infoworks! blog: Just for Fun! 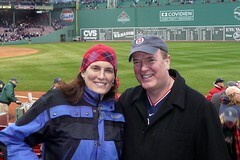 It was a cold but gratifying day — Opening Day at Fenway Park, April 7, 2009. Here I am with my brother lingering as the crowd files out after a 5-3 win over the Tampa Bay Rays. As an old bballer myself, I am so caught up in the Celtics v. Lakers excitement just over the bridge from Infoworks! 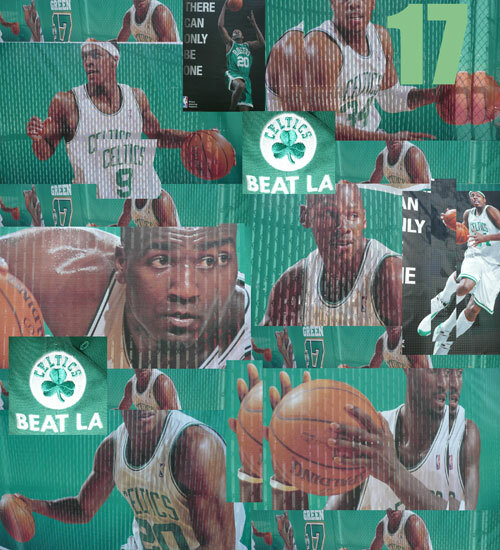 I stitched together this quilt made up of snapshots of the banners and fencing surrounding the Boston Garden in celebration of "The Finals," while waiting and waiting for the 9:00 p.m. tip off last night. Click through to see a slideshow of photos of the hoopla at North Station. Go Celts! My brother contributes to the creative team behind Svedka Vodka and came up with the topical "Campaign" campaign. With a little brainstorming I helped him come up with this one — Swing Voters Have More Fun. SVEDKA_GRL says: VOTE AND PLAY RESPONSIBLY.